Update Coming Soon! 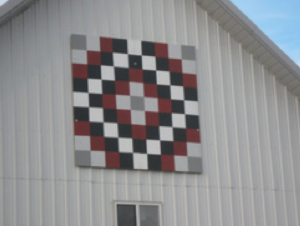 See where it all began in Cass County and see the original Barn Quilt Tour. We want to thank the Elmwood-Murdock High School’s Future Business Leaders of America for all their pioneering efforts in establishing this wonderful past time and will continue to post it’s original tour so that all can see where it started. Take a drive around Elmwood and Murdock to see the Barn Quilts created by the Elmwood-Murdock High School Future Business Leaders of America. They wanted to “IMPACT” the community by Involving Members, Promoting Activities, and Creating Tourism. Adding painted quilt blocks to prominent barns seemed like a good idea because together they created a unique tourist attraction with long-term potential. Twelve 8’ x 8’ barn quilts were created by Elmwood-Murdock art students, while FBLA members developed publicity, solicited barns, and generated funds for the project. All members of the chapter are convinced this project will impact the community for years to come. Go to elmur.org for more details and to print a brochure, or access the barn quilt tour information by visiting embarnquilts.weebly.com. Nestled halfway between Omaha and Lincoln and the grassy banks of two mighty and historic rivers, Cass County is a popular destination for families seeking serenity or adventure away from the city.